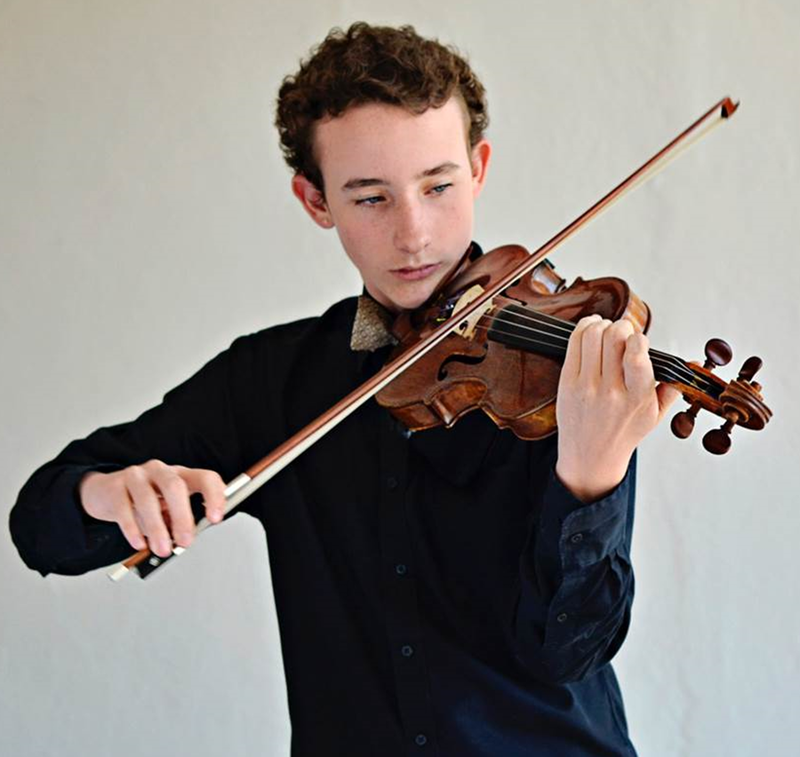 Phoenix Avalon, 16, is passionate about his study of the violin. He is honored to be studying at the Cleveland Institute of Music Young Artist Program with Jaime Laredo and Jan Sloman. He was a student of Carmelo de los Santos at the University of New Mexico for 6 years and began his violin training at Santa Fe Talent Education at the age of 3. Phoenix plays with the Cleveland Institute of Music Orchestra and is coached in chamber music by the Cavani Quartet. Phoenix’s solo performances include the national radio shows Performance Today (2016) and From the Top (as soloist in 2015 and in ensemble with the CIM’s Cecelia Octet in 2016). He soloed with the New Mexico Philharmonic (2016, 2015), the Boulder Symphony (2016, 2015, 2014, 2013), Performance Santa Fe (2014) and at Meadowmount School of Music public concerts (2016, 2015, 2014, 2013). He will make his debut with the Arapahoe Philharmonic in February 2017 playing the Shostakovich Violin Concerto No. 1. Phoenix is a 5-time recipient of the Performance Santa Fe Davis Award, a 5 year recipient of Starling Foundation grants for study at the Meadowmount School of Music, as well as being awarded a Jack Kent Cooke Scholarship. Phoenix was the strings winner of the 2015 Jackie McGehee Young Artist Competition, received second place in the Music Teachers National Association National Competition in Junior Performance and Honorable Mention in the Lynn Harrell Competition. Phoenix has played in master classes for Peter Salaff, James Ehnes, Kikuei Ikeda, Jinjoo Cho, Joseph Silverstein, Chad Hoopes, Kathryn Lucktenberg, Daniel Han, Kimberly Fischer, Richard Rood, Martha Caplin and for the Apple Hill, Szymanowski, Atrium, Brentano, Harrison, Jasper and Cavani String Quartets. Having grown up in Santa Fe, NM, Phoenix was honored to mentor the St. Michael’s High School Orchestra, in addition to playing for numerous fundraisers. In 2015 Phoenix participated in the From the Top Leadership Training where he developed an interactive presentation of classical music history, which he has offered for numerous schools. He has also played for various outreach programs throughout the country, including with CIM’s Young Artist Program. Phoenix is particularly grateful to be playing on a Giuseppe Guadagnini violin, c. 1786, generously loaned by Kenneth Warren and Son Ltd. of Chicago. In addition to violin, Phoenix studies composition with Dr. Andrew Thomas of Juilliard. He enjoys philosophy, history and cooking.